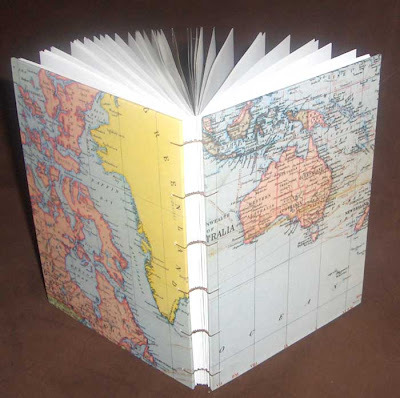 Kristin, known on Etsy as KristinCrane, sent this terrific travel journal for our third book swap. 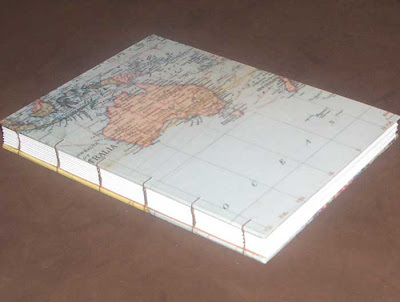 This hardcover coptic bound book features a map of Australia on the front and a bit of Canada and Greenland on the back. This blank journal has lovely exposed stitching on the spine that looks delicate but is very sturdy allowing the book to close nicely and open completely flat too. Visit KristinCrane.Etsy.com to find more of her books. Yay! I'm glad the book made it all the way to Australia :) Enjoy!